What happens when two beloved heritage brands meet up in the kitchen? 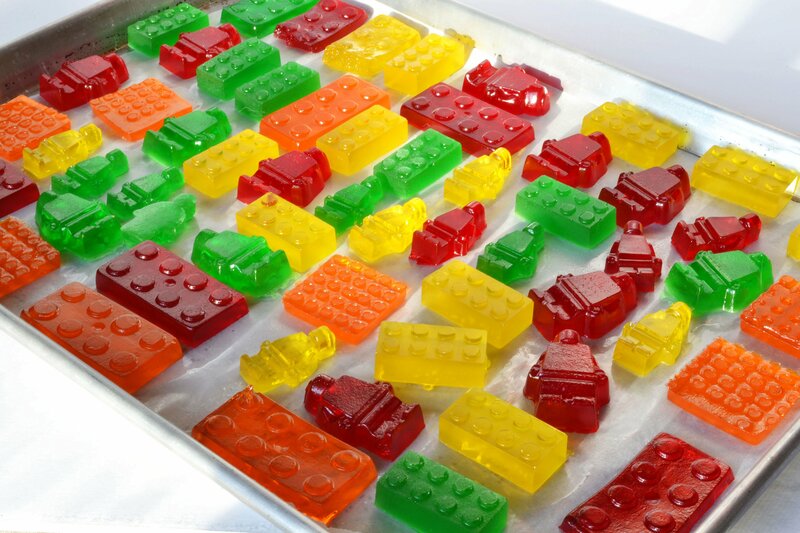 If it’s LEGO and Jell-O, you end up with a whole lot of fun and the cutest gummy candies imaginable. The best part is that all you need to turn your heart of the home into a fun factory is an ice cube tray or candy mold plus four ingredients: unflavored gelatin, Karo Syrup, Jell-O, and water! What you end up with are colorful, pliable, and deliciously edible treats. When the how-to for this adorable food craft hit the internet a while back, LEGO stores across the country ran out of LEGO ice cube trays, and I can see why. Fortunately, many other candy, chocolate, and ice cube molds work just fine. Bright colors and fun flavors are no problem. Just pick your favorite Jell-O variety, follow the simple instructions below, and pour it into your desired mold. This is a great kitchen craft to do with kids. Let them make their own gummy candies for their snacks and lunch boxes. However, it’s not just the kids who will love this idea. Imagine ending a dinner party with a bowl of homemade gourmet gummies. Go on, have a little fun! I did just that, and those yummy gummies were the topic of conversation the entire night. LEGO ice cube trays are available at The LEGO Store (Arrowhead Mall and Chandler Mall). Chocolate and candy molds in the shape of LEGO’s can be found at ABC Cake Decorating in Phoenix. In a small pot, add cold water. Sprinkle 2 packets of gelatin over water and quickly stir or gently whisk to dissolve. Add Karo syrup and stir until liquid is clear. Add package of flavored Jell-O and stir to dissolve. Heat liquid over medium low heat for about 2-3 minutes to help dissolve gelatin. Pour into a glass and let foam rise to the top, about 20 minutes. When foam begins to thicken, spoon it off so that all remains is clear liquid. Pour into molds. Refrigerate to let set up (about 2-3 hours).